Email marketing is essential for every site owner, and your email subscribers are the most loyal supporters and clients of your business. An email list with 100 subscribers is much more valuable than 1000 followers and will earn you more traffic and money blogging. If you have started a blog recently and want some loyal reader base then, email marketing is what you should consider first. I started this blog a few months ago, but due to my previous experience with blogging, I begin collecting email subscribers right from day one. I guess that’s the reason I got 17 email subscribers within first 30 days of launching this blog. When I started blogging, I started it with MailChimp, a favorite email service provider (ESP). What Made me Switch to MailerLite? 1. Free up to 2000 Subscribers: Since most of my money was spent on buying a domain, hosting, theme, plugins, etc. I didn’t have money to pay for a premium email marketing tool. Moreover, I wanted first to learn more about email marketing and if it will work for me or not, before spending my money. MailChimp has a free plan which lets you have up to 2000 emails and send 12000 emails per month before opting for the premium subscription. 2. Popular: MailChimp is popular, and it has some of the industry best features available. It helps a lot when you are new to email marketing and don’t know where to start. 3. Easy to Use: When you get into email marketing, there’s a lot to learn. You will be daunted with some technical terms, how-tos, optimizations. 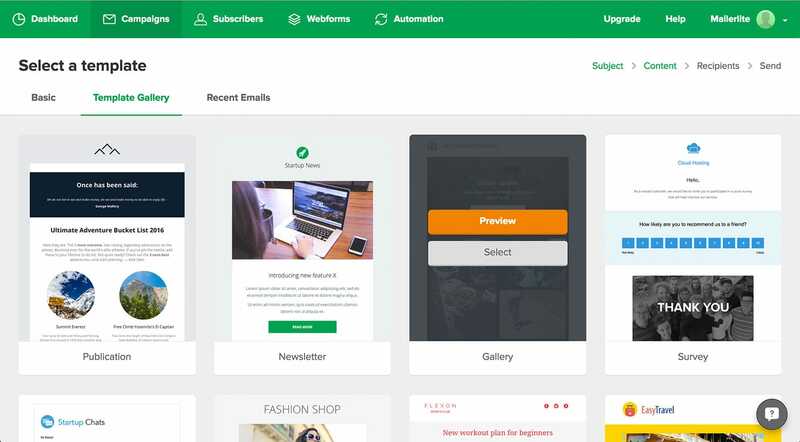 With modern features of MailChimp, it is a piece of cake for nontechies to create lists, groups, send emails, manage subscribers, and other stuff. 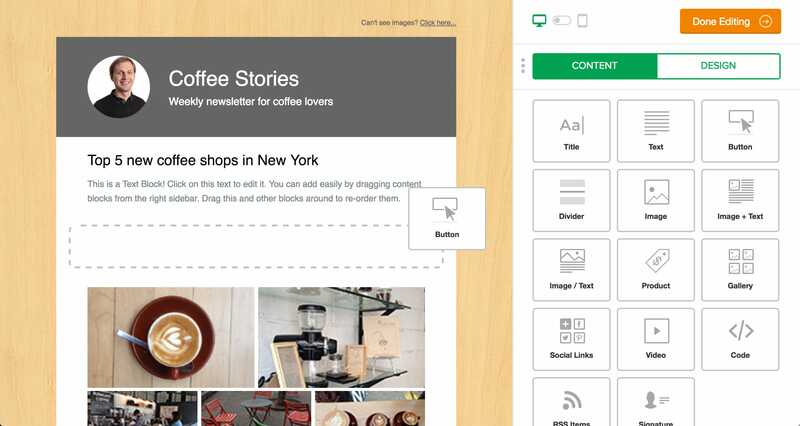 MailChimp makes it pretty easier to compose and sent your first newsletter. But, like I always said, free things come with limitations and MailChimp free plan had some undesirable limitations. 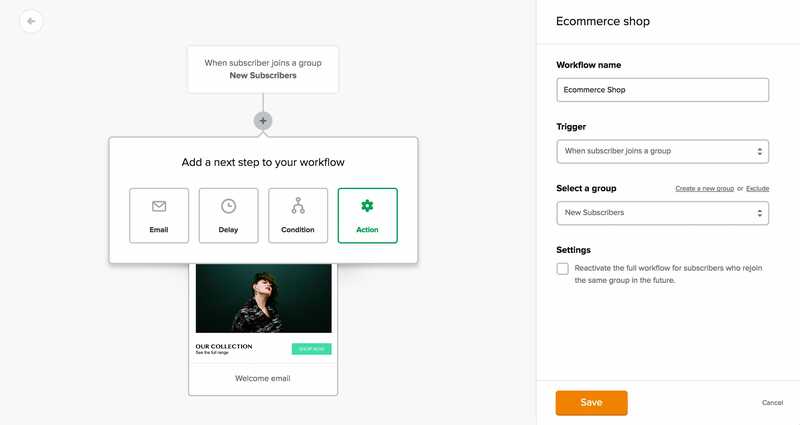 When you are subscribed to the free plan, you can’t have your hands on premium features like AB Testing, Autoresponders, removable MailChimp branding, etc. I was okay with others, but Autoresponders or Automated emails was one thing I wanted. Having Autoresponders make things a lot easier, and with swipe files & email series, you can grow your email list to multi figures. 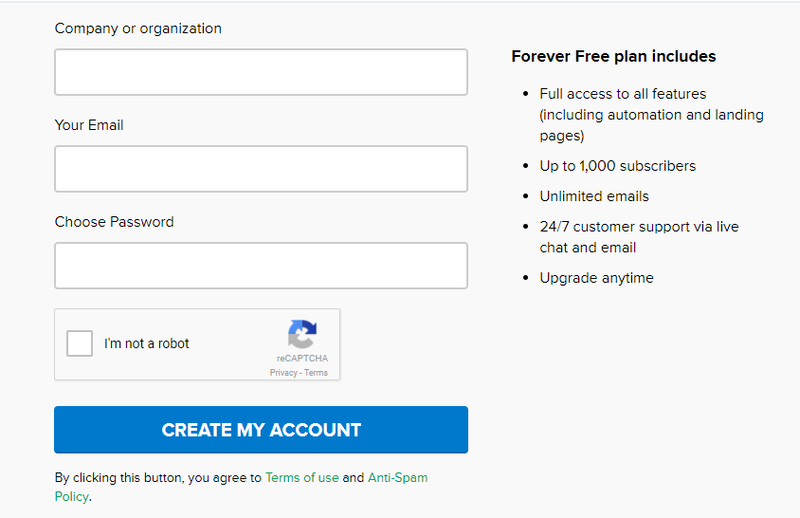 After using MailChimp for one entire month, I started searching for its alternatives w/ free plan and automation features. Thanks to ConvertPlug (best plugin to create email subscriber & popup forms) I got to know about MailerLite. And after reading its features on official site and MailerLite reviews by others, I made my decision of switching from MailChimp to MailerLite. I have been using MailerLite ever since and decided to write my honest MailerLite review and help other bloggers who might be looking for an affordable email marketing tool. If you’d rather skip the review and test the service yourself, use the below link to get extra $20 credits which will help you if you *ever* decide to scale up. A group of developers founded MailerLite in the year 2010 which makes it pretty new to ESP world. MailerLite is targeted to small businesses and bloggers, and the company aims to keep it as simple as possible. From signing up to creating a list to sending your first email, you will find hints, notes, and tutorials for damn every step. Although MailerLite is targeted to small business, the features and services offered are comparable with current ESPs. Unlike MailChimp, MailerLite offers you premium features on the free plan. Except for MailerLite branding, you get to use all the premium features. It lets you have up to 1000 subscribers for free and allows you to send unlimited emails to your customers. (MailChimp limits it to 12000 emails per month). Like I said earlier, MailerLite allows you to use automation feature which can be used to create autoresponders, email series or swipe files. All the tasks like creating Autoresponders in MailerLite is just a few clicks away. Moreover, you can customize your autoresponders by adding a name, email or address to the subject line. You can send an automated welcome email to everyone who subscribes to your blog. Or you can add a delay and send some other content after few days or hours. Whatever suits you! MailerLite’s Drag & Drop Editor makes creating visually appealing emails more comfortable and quick. You can drag and drop objects like text boxes, images, charts to your desired position and frame your email as you want. You can even add social links, signature, or RSS feed right from here without writing a single line of code. Additionally, each element can be customized as per your needs. However, if you prefer to go old school and use HTML formatting, there’s an option for that as well. If you are in a hurry and don’t have time to design emails, then you can choose from some beautiful pre-designed templates. There are templates for everyone and every type of email you would like your subscribers to receive. All these templates can be imported in one-click and responsive for all screen sizes. My favorite one is “Blog Updates”. With the help of RSS feed, every time I publish a new content, MailerLite automatically sends it to my subscribers without me having to lift my fingers. 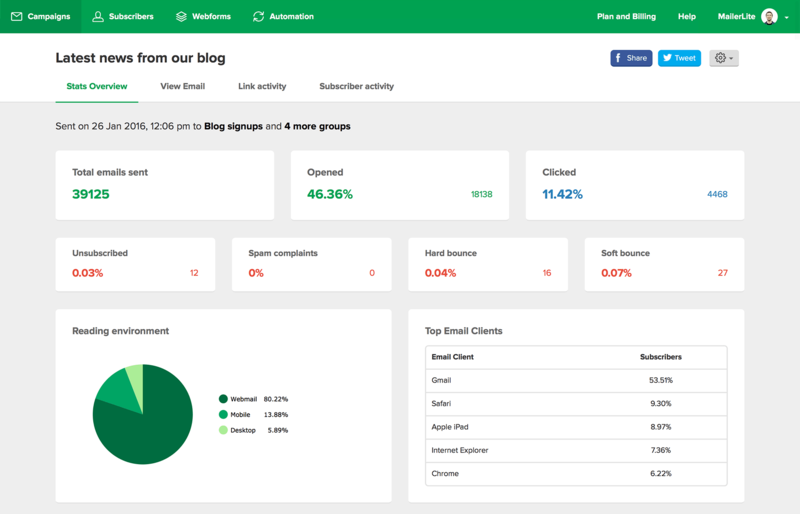 With the advanced email tracking of MailerLite, you can analyze the results of your emails. It lets you see who and how many subscribers have opened the email and click on the link present. With this feature, you can remove inactive subscribers from the list. You can also perform A/B testing and see what email works best and which one should be scraped off! BlogTyrant has an excellent post on the importance of cleaning inactive email subscribers. 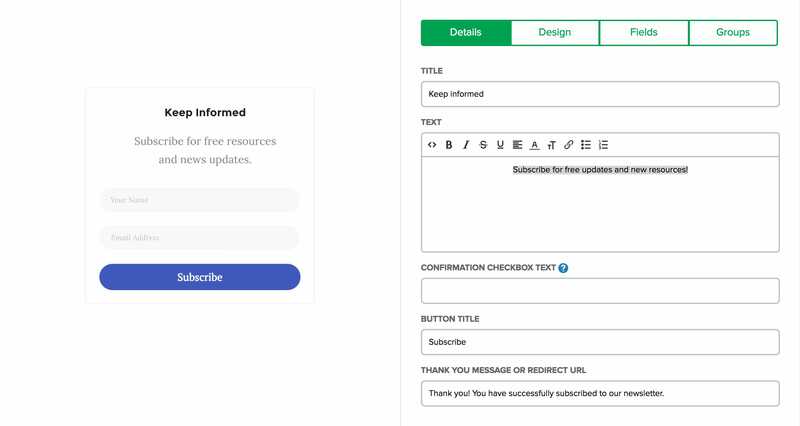 The very first thing you need in order to collect subscribers is a subscriber form. A premium subscriber form plugin costs at least $30, but with MailerLite you don’t necessarily need to buy one. It offers free embeddable contact forms that can be customized as per your needs, and then embed it on your blog – by copy/pasting few lines of code. Another important aspect of collecting leads is a landing page. But creating them needs knowledge and coding experience unless you either hire an experienced developer or buy another landing page builder tool. Additionally, hosting them on your site is again a pain. But with MailerLite, you don’t worry about any of these. You can develop landing pages from scratch or use one of their pre-made one. Also, the drag and drop editor makes it easier to customize it. And the most important plus point of MailerLite over MailChimp is its pricing. Here’s a price comparison table of MailChimp and MailerLite to help you understand it better. On average, using MailerLite saves you more than $100 per year, which you can utilize to buy some other product. There are Gazillions of other features which will make you fall in love with MailerLite, but for now, these are enough. Nothing in this world is perfect and so as MailerLite. Here are some of the limitations of MailerLite that you may not like. One of the biggest things I dislike about MailerLite is that it still counts the deleted subscribers and you have to pay for them (in the paid plan). There may arise certain cases when you delete subscribers, or some of them unsubscribe from your mailing list. In that case, your unique subscriber count will not be reduced, and you’ll still be charged for emails you aren’t using. I hope MailerLite will soon review this feature. “Deleted emails, unsubscribes, bounces, spam complaints or inactive emails are being removed from the counter after 30days. For example, you sent a campaign on 1st of January, and let say 100 emails bounced. So, this number will stay on the counter until 1st February, and then it will be removed. Counter updates every day GMT 00:00 and removes addresses, which didn’t receive any email for the last 30days. If you send campaigns daily, then counter daily removes email addresses, just with the 30-day lag”. Great to see this feature. Being new to the market, you will find MailerLite integration in few popular plugins only. For example, Bloom Plugin from Elegant Theme doesn’t support MailerLite integration thus making it usage limited. Creating an account on MailerLite is very straightforward. At first, you go to their homepage by clicking on this link (affiliate link) or by searching on Google. Once you are on the homepage, click on ‘SIGN UP FREE‘ button to create a free account. Next, fill up your data and verify your email address. If everything goes fine, you will have your account created. Please note that MailerLite may require you to verify your blog by using a domain specific email address (hello@domain.com). It is to prevent spam and duplicate accounts being created. Also, when your account gets approved, you will have a limit of 500 subscribers. It can be upgraded to 1000 subscribers, once you have reached the limit and haven’t violated any terms and conditions. I believe that you have an active account on MailerLite and you have access to it. If no, then please create an account first and then continue with the guide. 1. Login to your MailChimp account and visit your dashboard. 2. Click on ‘List’ from tabs in the top bar. 3. Here, you’ll see all the list you have created with visible stats. 4. There will be a drop-down button at the end of the list within stats button. 5. Click on ‘down arrow, ‘ and you will be greeted with multiple options. 7. On the next screen select (check) on the subscriber list, you want to export and click on ‘Export as CSV’ button. 8. Your list will be downloaded in a .zip format. Extract it to get the CSV format which you can import in MailerLite. Once you have got the CSV file of your subscribers, it’s time to import into MailerLite. 1. Login to your MailerLite account and visit your dashboard. 2. Now, click on ‘subscribers’ tab available on top of the screen. 3. Here click on ‘Add New Group’ button and give a name to it. It can be anything you like. 4. Once the group is created, click on the small green button with a + sign. 5. It will take you the next screen where you can either drag and drop or choose the CSV file you exported. You can also add subscribers by copy/pasting from Excel Sheet or by adding one subscriber at a time. 6. Once imported, you will be asked to match the columns with your subscriber list. Choose the one you would like to match (like email, first name, and last name) and leave the other to ‘skip this column’. 7. After it, click on ‘finish adding subscribers’ and you will see the final summary. It will show the total of subscribers that have been added to the group. Also, it shows and rejects all the invalid email address. All Done. You’ve successfully exported your subscribers from MailChimp to MailerLite. Go ahead and create a new campaign for your subscribers. Alert: If you’re making a blogging mistake by not collecting emails from day one, reconsider your blogging strategy. MailChimp is an excellent email tool for more prominent brands and businesses. If you have millions of subscribers and want an industry-best ESP to handle it, then MailChimp is the one you want to choose. On the other hand, MailerLite is an excellent option for bloggers and small businesses. And with the free plan, there is no possible reason to why you wouldn’t like to try MailerLite. Note: If you want to see the Autoresponder in action, then subscribe to my newsletter, and you will receive a nicely written email with a freebie attached to it. How is your experience with MailChimp? And what do you think about my decision of switching from MailChimp to MailerLite? Share in the comment section below. Don’t forget to share this post with your friends and followers. Also, pin the graphics on this page to your favorite Pinterest board. 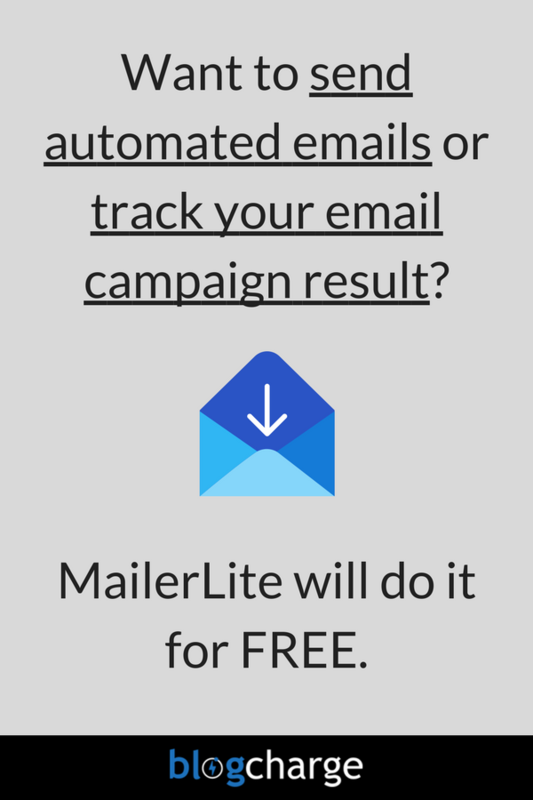 I stumbled upon to MailerLite in a need to find the perfect email marketing software that doesn’t cost a bomb and still manage my subscribers. MailerLite has all the necessary features which a blogger need + they are free for up to 1000 subscribers and unlimited emails. If you’re new to blogging and need an email marketing tool to get started with, I highly recommend MailerLite. Mailerlite didn’t approve my account, is there anything I can do? I have been using MailerLite for over a year today. They keep adding new features and making it better. The team is quite friendly, professional and skilled. One of the features I like there is AutoResend. I have used and seen it do so much to boost my campaigns. I’m so thrilled to see you on my small blog. Thanks for commenting and sharing your personal experience. And yes, lightboxes and content upgrade are handy features to improve the overall experience. After experiencing Thrive Comments on your site and seeing how great they work, I don’t think I’ll be able to keep myself away from them for a long time. Just wanted to say, I’ve shifted over to MailerLite a while ago. And I’m pretty impressed with the service quality, Front-End design and support. The article is so nice and helpful..
Great to see you on my blog. I’ve been following your blog and income reports for some time now. Great job there! Thanks for sharing your experience and keep visiting man! Thanks for the review! I started using MailerLite this year and so far am happy enough. Have you been able to figure out if its true that every email, even deleted and unsubscribes, still count towards the total count of subscribers we are paying for? I am not getting a clear understanding about this. Check the comment from Remis (I have also updated the post with the same) for a clear understanding. Hi Shafi, great review! I’m also a big fan of using MailerLite. I’m looking forward to their tool being used with more plugins and have more success in the future. It is pretty good and simple to use. The support team has been great and I have never been turned down. They have helped me a lot. As soon as my blog grows out of the limits of the free account, I’ll ask for an upgrade. For now, I’m happy with the free stuff. Thanks again for this review! MailerLite is indeed a great tool and useful for every small blogger since it features leading features at no cost. Thanks for commenting, keep visiting. It’s good to visit your blog again and again thanks for sharing this review quite helpful for me. Thanks for amazing words Ravi. Hey Good Mailerlite Review, thanks for sharing. I do accept that MailerLite has less integration support as compared to MailChimp, but they’re growing pretty fast and you can also request the team to integrate with a plugin, and they’ll do it soon. Regarding inline embed, there are hundreds of free+paid plugins available to help you place sign up form anywhere on the page. You can use any of them without any hassle. Moreover, MailerLite is free and you can’t expect everything spoon fed to you. I hope that answers your query. Hi! Thanks for the nice review! 🙂 I have a small comment re unique subscriber counter – deleted emails, unsubscribes, bounces, spam complaints or inactive emails are being removed from the counter after 30days. For example, you sent a campaign on 1st of January, and let say 100 emails bounced. So, this number will stay in the counter till 1st February, and then it will be removed. Counter updates every day GMT 00:00 and removes addresses, which didn’t receive any email for the last 30days. If you send campaigns daily, then counter daily removes email addresses, just with the 30 ay lag. Hope this helps! Thanks for clearing the doubt. I’m updating the above article as I have experienced what you said and it is true. I’m glad you found it helpful Aadil. Keep visiting. Thank you for sharing your experience of shifting from MailChimp to mailerlite. As far as your question go, from my experience and what I know, I don’t think it is the case. On my dashboard, I clearly see how many unique subscriber I have. It doesn’t include any non-subscribers and deleted emails. However, I’ll keep an eye on it and let you know if there’s any such thing. After observing, I got to know that what you were telling was right. Yes, the unsubscribed, as well as deleted emails, still count and we have to pay for them. I have updated the article. Thanks for the tip. We don’t count unsubscribed and deleted subscribers after 30 days. It means that every 30 days we reset your unique subscribers counter to 0. So you pay only for active subscribers you have. Thanks for clearing the biggest doubt I had about MaileLite. I’ll soon update the post when my subscriber count resets. Email marketing is required to boost your business. It’s important to have a better service provider. Mailerlite seems quite promising. Glad to know more about it. Yes, A better service provider is necessary for email marketing and MailerLite is by far is the most affordable provider I have used.